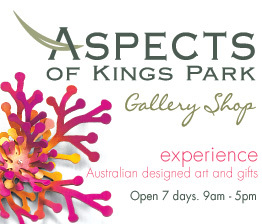 I'm thrilled to introduce you to my latest stockist: Aspects of Kings Park, a contemporary craft and design gallery in Perth, Western Australia. The gallery specialises in Australian and Western Australian work, integrating art and design, ecology, conservation and education. The gallery is located in the heart of the gorgeous Kings Park and Botanic Garden in West Perth, just outside Perth CBD (details on exact location and transport options available here). They are open seven days a week, from 9am to 5pm. I am really stoked to have a stockist in WA, and couldn't think of a more beautiful location for it!